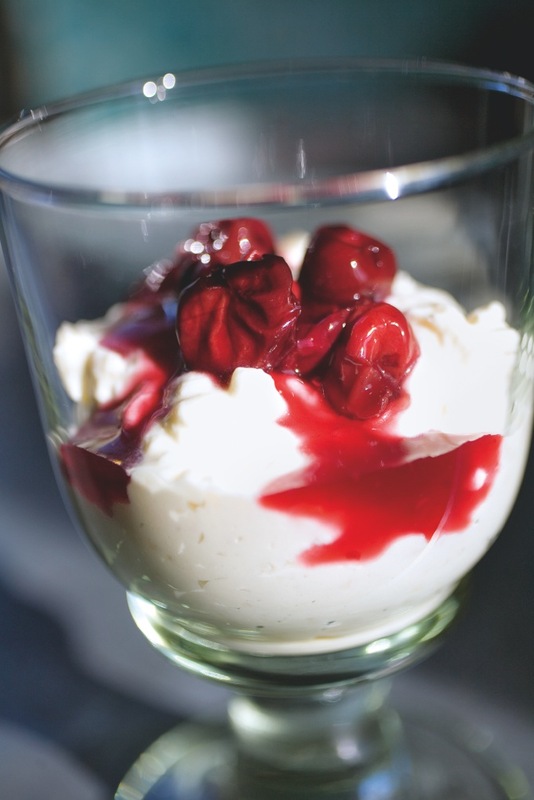 A creamy rice pudding with a holiday-red cherry sauce would be a welcomed site on a holiday buffet. This version comes from The Scandinavian Kitchen by Camilla Plum. 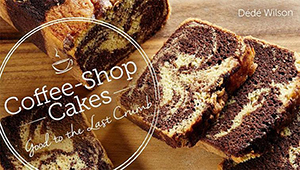 The book is packed with images, recipe and stories that draw you into a Northern European world. 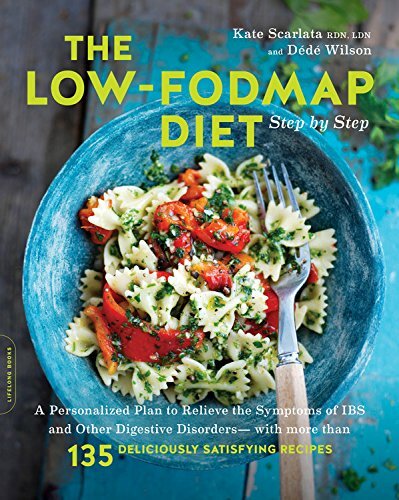 The food, indeed many of the ingredients, are not the typical kitchen or farmer’s market items for us North Americans and the book reads quite educationally while always remaining entertaining. The subtitle is “100 Essential Ingredients and 200 Authentic Recipes and you can treat it as a primer of this wonderfully diverse world of cooking and baking with lingonberries, gooseberries, elderflowers, fish of all kinds, skyr, a versatile soft cheese, breads and cookies redolent with cardamom and black pepper, and meats, poultry, game and offal. 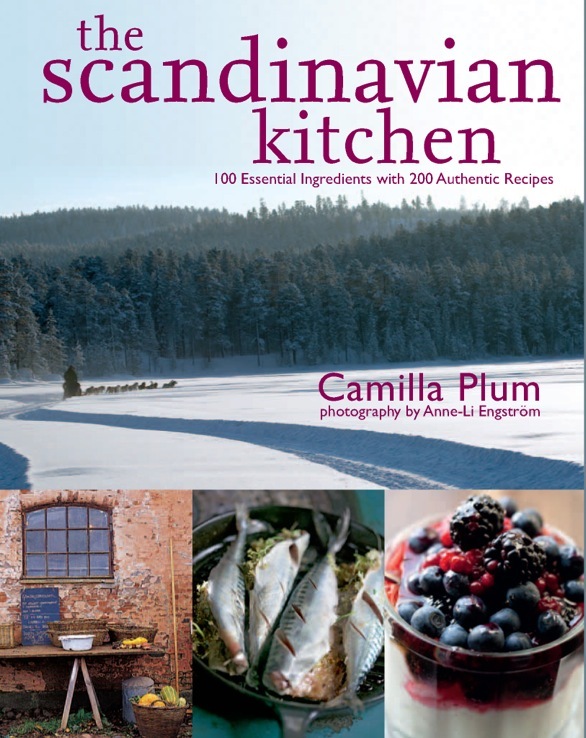 The Scandinavian Kitchen would make a nice holiday gift for someone interested in the cooking of this part of the world, which is so hot right now. Rice pudding itself is eaten frequently during the winter as a main course, dusted with cinnamon and sugar and with a generous blob of butter melting in the middle. It’s solid winter fare, and filling, but not for very long—we usually have evening tea with some bread and cheese later on. Eating rice at Christmas is a tradition from a time when everything imported, like rice and spices were luxuries. This almond rice pudding, (riz à l’amande) is relatively new, a bourgeois revival of the peasant hot oatmeal, and in the country it’s still usual to eat ordinary creamed rice for Christmas Eve dinner, either as an appetizer, as in former times, or as a dessert. It’s an age old custom to make sure the resident Nisse is well fed during Christmas. Lots of people, including my family, put a bowl of hot rice pudding in the attic on Christmas Eve, just to make sure. Riz à l’amande is lovely, and very rich, and actually not the kind of dessert I would normally recommend you eat after a heavy Christmas dinner of goose, duck, or roast pork. Tradition must not be tampered with, though, so in my family we usually eat it for breakfast the next day, in order to be able to go through with the traditional dance around the Christmas tree. We have a tradition, similar to that of hiding money or some other treat in the Christmas pudding, of including one whole almond in the dessert. This takes skill, as there is always someone most in need of winning the “almond gift,” and you have to make sure— very discreetly—that the right person gets it. The thing not to do is make a huge bowl of riz à l’amande and put the whole almond in at random. It always ends up in the last spoonful, even if this is not statistically possible, and everybody gets a stomach ache from eating too much. Instead, serve the pudding in individual glasses, in small portions. The gift can be anything, but often it is a homemade piglet, made from marzipan, with rosy painted ears and snout. The classic accompaniment is hot cherry sauce, a glass of cherry brandy, or a fine tawny port. For the sauce: Put the fresh or frozen cherries in a large, wide saucepan. Heat the fruit until the juices run, then add the sugar, and boil vigorously until you have a beautiful, garnet-colored syrup holding juicy, whole cherries. When you are ready to eat, warm the sauce and stir in 1–2 tablespoons cornstarch mixed with enough cold water to form a thin paste. Boil for 5 minutes and serve. The sauce, up to the stage when you add the cornstarch, can be prepared several days ahead. For a more pronounced almond taste, you can add a couple of finely grated Spanish almonds to the sauce as well. Or if the sauce seems rather insipid, add a spoonful of lemon juice. Neither of these measures should be necessary if you make your own sauce from scratch. 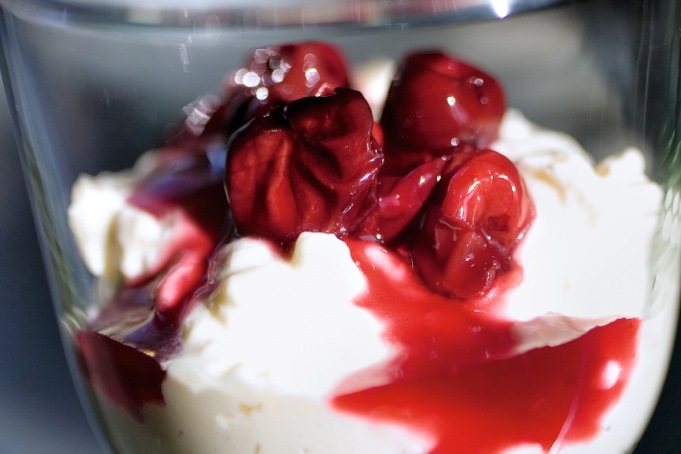 If you are using preserved cherries, you don’t need to boil the fruit at all. Simply heat the syrup in a saucepan and add 1 tablespoon cornstarch (mixed to a paste with a little cold water), which should be sufficient for a 3 ⁄4pt jar. Boil for 5 minutes, then add the cherries at the last minute. If all you can obtain are the Italian Amarena cherries, these are very sweet and definitely over the top as far as taste goes, but fine as a rather overwhelming substitute. For the Pudding: When it comes to making creamed rice, it’s all about the right saucepan. It must be thick-bottomed, or the rice will definitely burn. Slash the vanilla bean lengthwise, then put all the rice ingredients in the pan. Bring to a boil, while stirring, and then turn down the heat to a minimum. From now on, do not stir unless absolutely necessary, as you want whole, chewy rice, covered in creamy milk, not rice sludge. Let it simmer until the rice is only just done, no longer. (You may need to add more milk, depending on the rice you use.) It will finish cooking during cooling. The cooking may take 45 minutes, maybe less. If the rice is taking up much-needed space on the stove, you can make an old-fashioned hay box instead. Fill a wooden box with hay—or crumpled newspapers and towels—and put the pan in after it has first come to the boil. Remember to cover the lid with lots of towels. Let the pan sit until the rice is succulent and swelled. This will make a better rice pudding, and is also effective with dried beans and peas and meat that otherwise would use a lot of power. If you are familiar with risotto, you can choose to make the rice pudding risotto-style. Use the same ingredients as above, but use risotto rice. Heat the milk in a separate pan, and patiently stir it into the rice a ladleful at a time, adding more as soon as it is absorbed by the rice. Whichever method you use, cool the creamed rice immediately: even if it’s warm, it must go directly in the refrigerator, unless of course you intend to eat it as is. And a warning: the creamed rice must be absolutely cold before you add the cream, or you will end up with a disgusting bowl of inedible, smelly, cheesy rice. To finish: Whip the cream, but only until soft. Chop the Spanish almonds, remembering to reserve one whole almond; and be sure to leave a few deceptively large pieces among the others. Fold half of the cream, all the sugar, and both the chopped and ground almonds into the rice. Mix well, ensuring there are no lumps. Fold in the rest of the cream, then cover the entire bowl with plastic wrap—nothing absorbs refrigerator odors like this pudding. Put the rice in the refrigerator immediately. Serve in individual glass dishes, in one of which you have concealed the whole almond, so that you can present that dish to the appropriate diner. Hand the cherry sauce round separately.